Nothing can match the feeling of parenthood after years of waiting. It was a great pleasure to see the happiness of the Proud parents Mrs. Sharmila & Lalit Sharma, who were blessed with a lovely daughter after years of waiting on the 27th March 2012. The parents celebrated their First Divali, the festival of light, with their most treasured blessing, their newly born daughter fondly named as AASHI. The joy of the parents can be experienced from the card they presented to Dr. KD Nayar at Akanksha IVF Centre on the auspicious occasion of Divali- The Festival Of Lights. We are sure you can feel & share the exhuberance & joy of the parents. 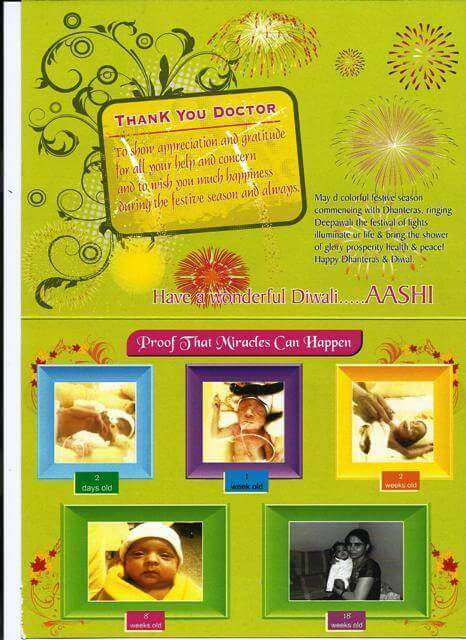 We hope that you will also give your good wishes to the proud & happy parents of baby AASHI. The AKANKSHA IVF CENTRE TEAM.